There is a new book on my reading list for 2018: best-selling author Daniel Pink’s When: The Scientific Secrets of Perfect Timing. Pink’s book focuses on the science of timing to help us make smart decisions in our lives. Our lives are a never-ending stream of “when” decisions. There are little “when” decisions: when is the best time to study for an exam, when are you most productive at work. And there are the big “when” decisions: when to start a business, start a family or change careers. Both the Wall Street Journal and Toronto Star have written articles on Pink’s new book. The article in The Star focused on New Year’s resolutions and why “fresh starts” like at the beginning of the year, really work. To establish a fresh start, people use two types of “temporal landmarks”— social and personal. Social landmarks are those that everyone shares Mondays, the beginning of a new month, national holidays. The personal ones are unique to each person: birthdays, anniversaries, job changes. These time markers allow us to clear the slate on the past and help us see beyond the minutiae of day to day living to see “the forest beyond the trees” for a fresh start. 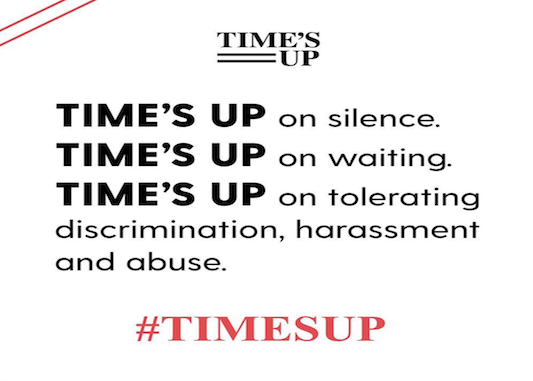 I am hopeful that 2018 is a fresh start for all of us and that #TimesUp. You don’t have to tell Tarana Burke timing is everything. The founder of the #MeToo movement has been quietly, tenaciously, devoting her life for ten years promoting empowerment through empathy, raising awareness of inequality and sexual harassment against women. But it wasn’t until actress Alyssa Milano urged women this past fall on social media to speak up using the hashtag #MeToo that we were able to crest the tipping point to create a wave of support and change the dialogue and power imbalance between men and women on sexual harassment. The wave became a tidal wave this January with the creation of #TimesUp, a legal organization formed to pay for and provide legal support for victims of sexual assault and the platform and voices of powerful women like Oprah Winfrey and Reese Witherspoon. I am hopeful it is finally our time—time for women to be truly viewed and treated as equals. I am hopeful that every organization will look within its own walls with a microscopic lens and make changes to ensure equal pay for equal work, and equal representation of women on boards and in the C-suite. That every government implements policies to ensure women are protected, can receive an education, and can live freely without fear of retribution or harm. That every father and grandfather teaches their sons and grandsons to treat women as we deserve. And that some day soon, every woman will feel finally, it is our time.